As a leading LASIK surgery provider in Dubai, the Atlanta Vision Clinic continues to invest in new technology to ensure our patients receive the safest surgery with the best possible outcome and drastically improved vision. We are proud to now offer the newest advancement in LASIK technology: the iFS IntraLase™ method. IntraLase™ has revolutionized laser eye surgery by replacing the microkeratome blade with a computer-guided laser, and is completely blade-free. The results are 100 times more accurate than traditional LASIK performed with a blade. This technology allows us to create a completely customized LASIK experience for patients, provides greater assurance that the first step of the LASIK surgery will be accurate and safe, and helps ensure the best possible LASIK results. And because corneal flaps created with the IntraLase™ procedure are thinner and more accurate than microkeratome-made flaps, people with thinner corneas (who may have previously been turned down for LASIK) may now be eligible candidates. The Atlanta Vision Clinic LASIK surgery center in Dubai is one of the first practices in the country to offer the iFS™ Advanced Femtosecond Laser. This fifth-generation iFS™ Femtosecond Laser provides the same level of safety, precision and high-quality results as the fourth-generation laser, but performs the procedure at faster speeds, creating a corneal flap in less than 10 seconds. 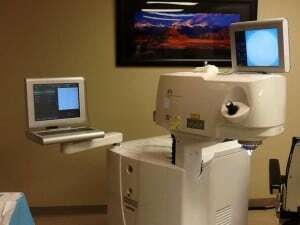 Additionally, the new iFS™ Laser includes a high-resolution digital video microscope, a touch screen and an ergonomic design, all of which help provide patients with a more comfortable LASIK experience. It also has lower energy output, which helps reduce tissue inflammation, and is fully customizable to tailor the surgery to a patient’s unique eye characteristics. The procedure is safer because it is entirely blade-free, which eliminates more serious complications caused by the bladed microkeratome. The all-laser surgery provides better precision and predictability. Patients experience less dryness after surgery. Fast flap creation allows procedures to be completed in 10 seconds, reducing the amount of pressure buildup in the eye when compared to the bladed microkeratome. Patients experience improved comfort, safety and satisfaction. The ability to create thinner flaps allows us to operate on patients with thinner corneas, and increases the chance of 20/20 vision or better. It is a faster procedure: Flaps can be created in as little as 9 seconds and the entire procedure for both eyes can last only 10 minutes total! It allows us to make a true, customized to fit each patient’s eyes and needs: We are able to make an inverted, bevel-in edge for the corneal flap, which allows us to tuck the edge of the flap underneath the periphery of the cornea, rather than resting on top. This has been shown to create stronger flap adherence. The corneal flap can be created in an elliptical shape which can provide an added benefit to patients with astigmatism. Faster procedure: flaps can be created in as little as 9 seconds and the entire procedure for both eyes can last only 10 minutes total! True customization to fit each patient’s eyes and needs: Ability to make an inverted, bevel-in edge for the corneal flap. This modification allows the LASIK surgeon to tuck the edge of the flap underneath the periphery of the cornea rather than resting on top. This has been shown to create stronger flap adherence. The corneal flap can be created in an elliptical shape which has shown added benefit for patients with astigmatism. If you have questions about IntraLASIK surgery or would like to find out if this new technology is right for you, please call us at 971-04-348-6233 to schedule a LASIK exam in Dubai.